While human skeletal remains in ancient strata have been identified (Corliss, William R. , Ancient Man: A Handbook of Puzzling Artifacts, 1978), none of these finds has been solidly established. It is to be expected that few such specimens would be found. Indeed the intelligence and mobility of antediluvian men would have caused them to be moving to higher ground in the initial weeks of the Flood. The result would be fewer bodies buried and fossilized and more floating and decaying. 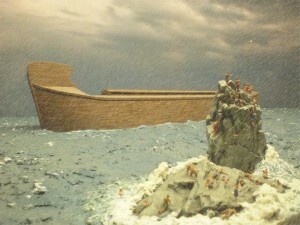 Moreover, the explicit purpose of the Flood was to destroy that wicked civilization (Genesis 6:5-7). (Snelling, Andrew A., “Where are All the Human Fossils?,” Creation Ex Nihilo Technical Journal vol. 14, no. 1, December 1991- February 1992, pp. 28-33.) The lack of human fossils is actually more of a problem for evolutionists. If humans have lived on Earth for millions of years, there should be hundreds of millions of human fossils, not just a handful. Nonetheless, a few human fossil finds are potential candidates for pre-Flood classification. The controversial Guadeloupe skeletons are a good example. These specimens were first brought to the attention of the creationist community by Bill Cooper (“Human fossils from Noah’s Flood,” Creation Ex Nihilo, vol. 5, no. 3, 1983, pp. 6-9). Several skeletons encased in limestone were discovered in 1805 near Moule on the island of Guadeloupe, and the island’s governor decided to excavate. At the time, no fossilized human bones had been documented. Eventually the 5 ft 2 inch skeleton of a female was taken (still encased in a 2 ton limestone block) to the British Museum of Natural History, where it was on display for 50 years. Initially, these skeletons were deemed to be very ancient, from the deluge in Noah’s day. In 1825 Cuvier and others reexamined the skeletons and determined that they were more modern. Today, that skeleton is being housed in the basement of the British Museum. According to the report of the excavators there are more skeletons remaining in the Miocene limestone strata east of the village of Moule. Important questions remain. Even though this limestone is as hard as marble, it formed around these skeletons rapidly, before they could fall apart. If current processes speedily built up this limestone, then how come erosion originally revealed the skeletons to the islanders? How can the unlikely process of rapid, recent limestone buildup also be happening in the interior of the island? Since the above articles were published, additional specimens have been found in the same area (between 50-100 ft away). The original mining ceased in the 1970s because the hardened sandstone was tearing up the bulldozers. The specimens found in the 1990s were even deeper into the hillside. 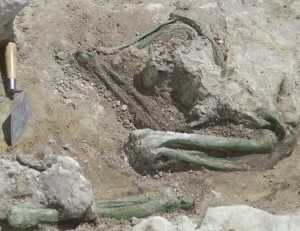 They have been dubbed “Malachite Man” because of the green and turquoise colorations that have stained the bones. Some have theorized that it could be an Anasazi Indians burial site. But this would mean the Anasazi dug down 100 ft through very hard limestone to bury their dead! Others have postulated that the burial was the result of a mine caving in. But there is no evidence of a mining shaft (which would have to be quite long to arrive at the depth of 100 feet) or any mining tools. The fact that skeletons of women and an infant have been discovered pretty much rules out the mining accident theory. 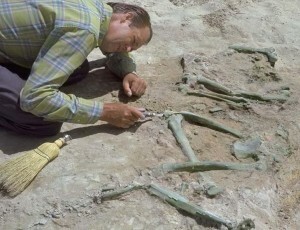 All of this is good evidence that these skeletons buried under Jurassic Dakota sandstone were pre-Flood. A leading evolutionist has said, “We should be very surprised, for example, to find fossil humans appearing in the record before mammals are supposed to have evolved! If a single, well verified mammal skull were to turn up in 500 million year old rocks, our whole modern theory of evolution would be utterly destroyed. Incidentally, this is a sufficient answer to the canard, put about by creationist and their journalistic fellow travelers, that the whole theory of evolution is an ‘unfalsifiable’ tautology.” (Dawkins, Richard, The Blind Watchmaker, 1986, p.225) But the methodology for dating rock layers largely protects evolution from such an embarrassment. Besides, when the evidence is too strong to deny, evolutionists will slide into “just so” stories and double-standards to explain away anomalous placement. That is exactly what they have done with Malachite Man.